Killer in Arena, can easily turn a game around. Especially on curve. I always include 1 copy of this in my quest paladin decks. Really catches people off guard and can turn a bad luck Galvadon into a monster! As a side note, this is pretty good as your only spell with Spiteful Summoner. Drew Patches in my opening hand as a Rogue. I got this from Hallucination mid game. By turn 9 I had a 10/10 Charge who won me the game. Blizzard sure loves giving me this epic. Opened my 4th one and counting. On an extra note, I am still lacking at least 7 interesting epic cards from the set, and almost every other I do have is not repeated too. Everyone has this problem. I strongly suspect it's set to where you're more likely to open a card you already own 2 of vs. a new, unowned one, but some people would have to compile a large enough data set and crunch the numbers to see what the actual chances are. As far as I know, no one has ever bothered measuring this. 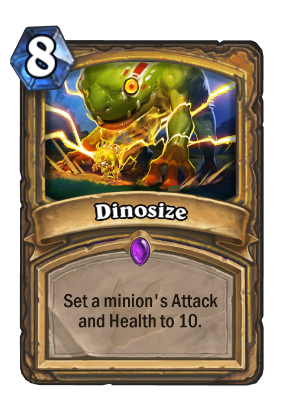 Don't forget about Dinosize's soft removal capabilities, ala Polymorph: Boar. Deathwing? Ha! More like five-sixths of a Deathwing now! I don't have this card, but I drafted 2 of these for my current arena run. Been playing it with things I get off Lost in the Jungle , Imp Master , and Doppelgangster. Makes me feel like I'm playing a 10/10 Charge if you know what I mean. working very nicely in my elemental paladin deck. Best golden animation of the expansion? It would be actualy good in different meta, but right now I expect a lot of Jade Behemoth, Jade Chieftain and Tar Creeper so not as pyroblast-y as you would wish. Oh man, are you guys ready for the Angry Chicken + Dinosize + Elven Archer meta?!?! This is the one true dream. Godspeed, ye faithful of the Angry Chicken, who have never stopped trying to make that card work. I'd almost WANT to lose a game to a triggered, dino-sized, angry chicken.